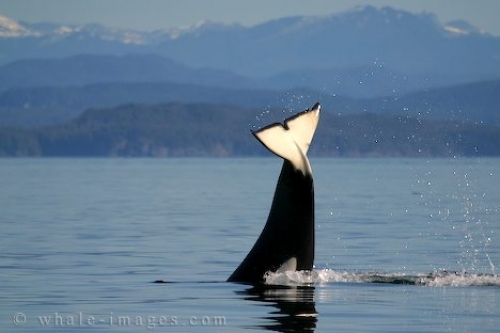 Obviously pretty proud of himself, this transient killer whale was seen killing a dolphin in the morning. Shortly afterwards I caught him on camera spy hopping and tail lopping, a kind of "give me five" in whale language. Social behavior like displaying whale tails is not as common in Transient killer whales as it is in Residents, but I was fortunate to catch sight of this whale tails.